I spent Midsummer in the Nordic countries last year. Oh boy, what an experience. One of the things I still had on my to-do list for Finland and the Nordic countries was to spend one of the white nights fully awake. And I did well: I stayed awake three nights. The sun leaves and the white night starts. It is hard to sleep in Finland during the summer, especially for people who are not used to that. The amount of hours without direct sunlight is very small, and the sun is already shining very brightly on the horizon around 3 or 4 a.m. The locals don’t seem to notice – and there are no shutters in Finland’s bedrooms – but people like me, who are used to the simple routine of daylight during the day, darkness at night, wake up more often during the white nights and don’t rest as well. But while visiting Finland or any other Nordic country it is, of course, a wonderful experience: The body has much more energy and – if the clouds let it – it leaves you smiling. I enjoy spending as much time as possible under the sun after a dark winter. That’s a lot of light for it being midnight. The white nights aren’t the same as the midnight sun, but almost. Both phenomena happen in the north of Europe, but the midnight sun happens much further north; to be precise, north of the arctic circle. In this place the sun is visible in the sky during 24 hours at least one day per year. In the northernmost parts of Europe the sun stays up in the sky for weeks without setting. But what happens below the arctic circle line? That’s where the white nights happen. 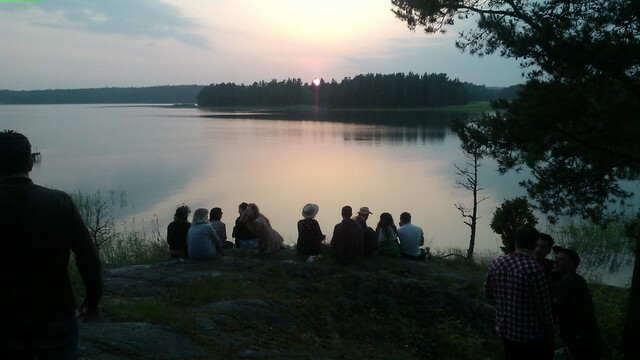 During the white nights the sun sets for a while, but its light can still be seen on the horizon. The night sky isn’t black, it is blue. 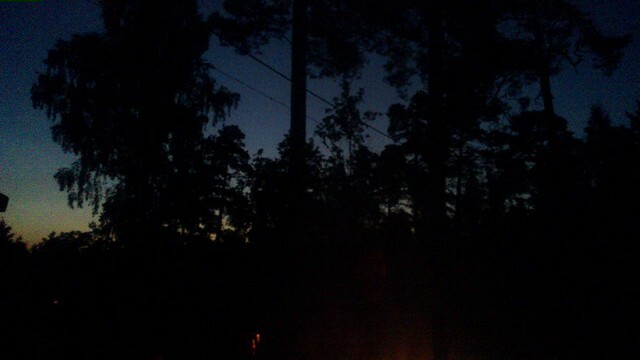 The nights are brigt enough to walk in the forest or on the streets without the need of artificial light. The opposite of this phenomenon is called the Kaamos in Finland: The polar night. The dotted line is the arctic circle: Above it there is midnight sun and below it the white nights happen. Source: Wikipedia . During my last visit to Finland, I wasn’t sure if the area I was going to be in was an area where I could see the white nights. My location was south of Helsinki’s latitude, more or less the same latitude that Tallin is, and that is very much south of the arctic circle. That’s why I was so surprised to encounter the white nights: I didn’t plan that on my trip. Around 10 p.m. the sun set below the horizon, and kept that position until 12 or 1 a.m., the darkest moment of the night. Then everything became clearer and clearer until we saw the sun again, around 3 to 4 a.m. But the clarity of the sky – and that’s the thing – never left. The sky was blue and the place where the sun was below the horizon had a fantastic reddish color. 1 a.m.: The darkest moment. The effect that it had on me it was revitalizing. I wasn’t tired or sleepy. The three nights that I spent on my trip I was awake all “night” and able to see an early sunrise. 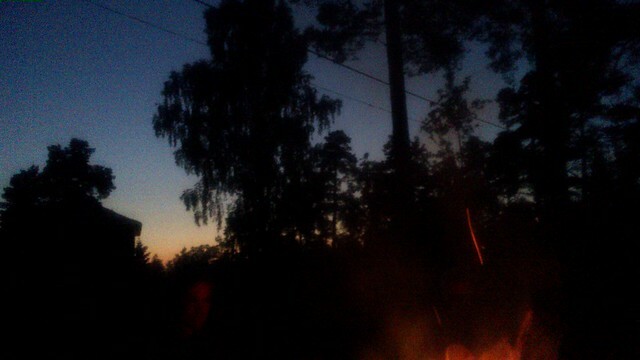 No surprise: It was Juhannus – the midsummer, something we’ll talk about soon – and there were some parties with lots of friends, a ton of sauna, and a cottage outside the city. And so we did it each night. Even if during the day it was sometimes cloudy, the evenings and the mornings were clear, and that made the white nights one of the best things of my trip. I can’t wait to see the white nights again. Have you seen the white nights? What did you think about them?